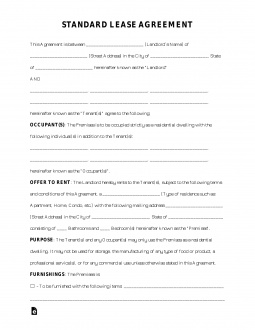 The Standard Residential Lease Agreement Template is the most widely used landlord-tenant contract. It is a fixed arrangement usually lasting for a period of one (1) year and both parties shall be bound until the end of its term. The document must follow all State Statutes and contain all disclosures as provided by law. 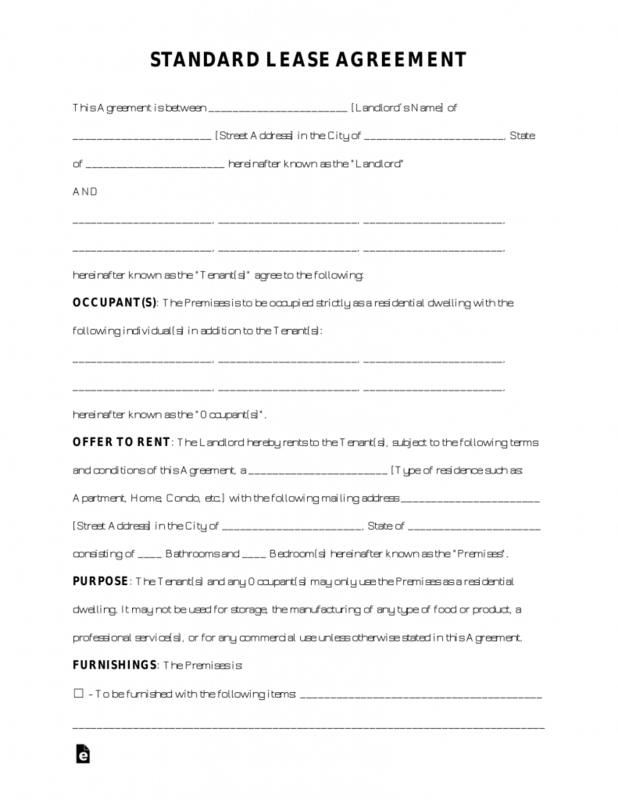 After the form has been agreed to, along with the disclosures attached and security deposit provided by the tenant, the form is ready to be signed by the parties. Residential Rental Application – For landlords and property managers to verify the tenant’s criminal and employment background and credit history. Can the Landlord or Tenant Break a Standard Lease? Does a Lease Need to be Witnessed or Notarized? Can I add a Roommate to a Standard Lease? Can the Tenant Remain on the Property After the Lease Ends? Is it Possible to Transfer a Lease? What if the Landlord Violates the Lease? A Standard Residential Lease is the most basic and popular type of document used when renting property to an individual, known as a tenant. It is highly customizable which is very important for landlords and property owners who wish to alter the agreement according to their needs and property type. The 3 main subjects a lease should entail is the term (length of time), the amount per month or period, and any type of deposit such as a security or pet deposit. The lease guarantees that the rights and responsibilities of both landlord and tenant be ensured, according to the state. A Residential Lease Agreement should be used when leasing any kind of livable property to a tenant which may include a house, apartment, room, condo, mobile home or some other type of habitable property. It’s very important to use a lease to minimize disputes and if ever a problem results in the need for court, such as an eviction, a lease is needed in order for either party to win their case, especially the landlord. Military or Government associated leave (State and Federal laws have authority over the rules to which the termination can occur). The health of the tenant or an immediate family member that requires relocation. Relocation in relation to tenant’s current or new job (Dependent on local state laws). The lease should be reviewed for early termination clauses that allow for it to be broken with no penalty. If no clauses are found, the tenant may attempt to have legal clauses added to allow for the lease to be broken without penalty. Clauses are provided at the discretion of the landlord, or property management company if acting on the behalf of the best interest of the landlord. Dependent on the reasons for the tenant to break the lease, some states provide options that would not hold the tenant liable even when not stated in the Standard Residential Lease Agreement. Negotiating a lease agreement is determined by a multitude of factors starting with market conditions and how the property is priced versus other rentals in the area. The landlord’s goal is to collect as much rent each month as possible while mitigating their risk. If the applicant can represent that they would be a stable tenant, the landlord may give them a discount on the monthly rental amount along with including utilities or services. Employment History – The landlord wants to see a long and stable job history that includes staying at each company for 3-5 years. Any less than that, or long periods of unemployment, will be deemed as high-risk to the landlord. Current Pay Stubs – In order to prove one’s income, the landlord would like to see the applicant’s last 2 weeks’ pay stubs. This can be either gathered directly from the employer or through a bank statement. Landlord History – If the applicant has rented previously in their life, they should gather past landlords and property managers contact information as a viable reference. 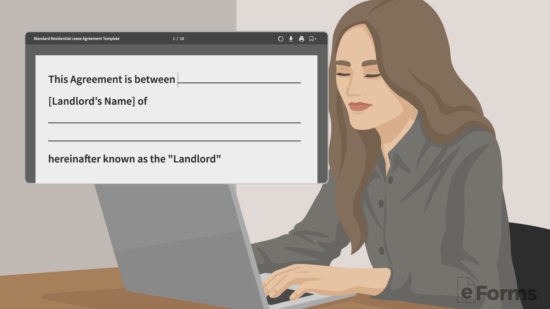 The primary difference is under a Standard Lease Agreement the term is fixed and under a Month-to-Month Lease Agreement it may be canceled anytime by the landlord or tenant. The agreement can be changed with notice. Can the Landlord or Tenant break a Lease? The short answer is no. The landlord and tenant, unless there is a termination clause in the lease, cannot end the lease before the end date. Although, both parties have avenues they may pursue in order to attempt to cancel the agreement in an amicable manner. Offer a Payout – Negotiate with the tenant what it would take for them to move-out early. Start with returning their security deposit immediately and offering to pay for their moving costs. Offer Free Rent – If the landlord would like the tenant to move out in 2-3 months time, get the tenant to agree by offering them free rent until the early termination date. Offer the Security Deposit – Offer the landlord the security deposit as a good-faith effort to get out of the lease. This is at least a starting point and is generally more than what most tenants do. 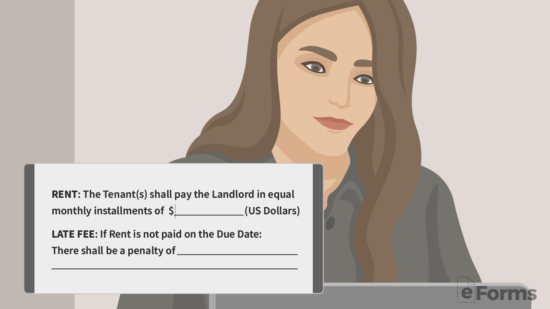 Offer an Extra Month’s Rent – If the tenant did not have to pay a security deposit at the beginning of the lease, the landlord may be inclined to take an extra month’s rent or equivalent payment to let the tenant out of the lease. Plead Financial Hardship – If the tenant can prove to the landlord that they have lost their job, in some cases, the landlord will offer a release rather than fight the tenant through an eviction. Claim Domestic Violence – In some States, like Nevada, there are laws that allow the tenant to break the lease without penalty if the tenant is a victim of domestic violence. Any tenant that is a victim of domestic violence should seek immediate help regardless of local laws. The length of time of a lease agreement is identified as one of the requirements of the contract. A lease agreement can be created for month-to-month leasing, six months, one year or more. Lease agreements are not required to be the same set amount of time. At the end of the current lease (fixed term) the landlord may wish to extend the lease to the tenant, as a lease agreement does not automatically renew, unlike a rental agreement. The current lease agreement will need to be amended or a new legally binding agreement can also be signed. In all 50 States, a lease agreement does not need to be signed with a witness or notary public as long as it’s no more than a period of one (1) year. If longer, States like Florida, require additional signing requirements such as witnesses to be present. Can I Add a Roommate to a Lease? In the event the tenant is adding another individual to the residence (i.e. roommate, family member, etc. ), the lease agreement should be consulted for requirements. Standard Residential Lease agreements have guidelines that new tenant additions be added specifically as a co-tenant. The additional tenant may be subject to criminal and financial screening, and rental history review. Furthermore, the current lease agreement may need to be reviewed to ensure the occupancy limit is not exceeded. Can the Tenant Remain on the Property after Lease Expiration? 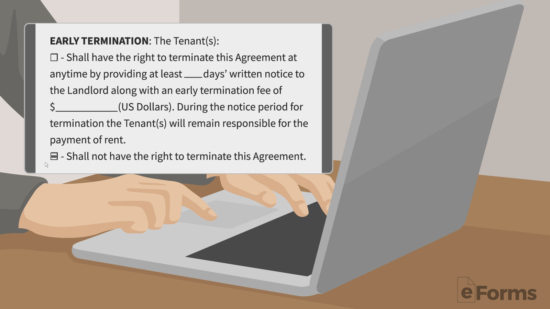 The tenant will have to read their lease as most agreements automatically convert to a month-to-month lease (tenancy-at-will) if there is no termination by either party. In most cases, the landlord will send the tenant a Lease Extension Addendum before the original lease ends to extend the term. The extension will detail the new end date, along with any other changes, while maintaining the rest of the terms of the original lease agreement. Is it Possible to Transfer a Residential Lease? Unless the agreement has assignment rights, a lease is not able to be transferred to someone else. 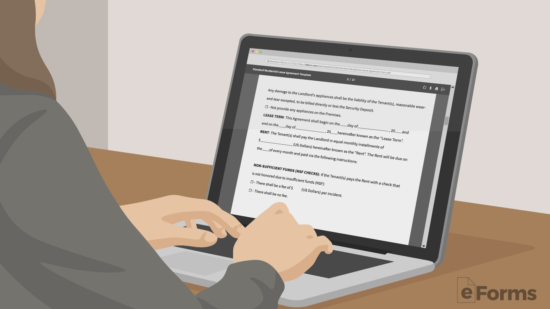 By default, most leases have language that specifically prohibits the assignment of a lease agreement. Although, a common practice endorsed by landlords is to allow a tenant to sublet the property. In a Sublease Agreement, the tenant re-rents the property to another individual who pays rent to the tenant who then pays the rent as stated in the original lease signed with the landlord. In most cases, the tenant will need to obtain permission from the landlord, via the Landlord Consent Form, before being able to find a sub-tenant for the property. If the landlord violates the lease agreement, the tenant, subject to State law, will be obligated to contact the landlord of the violation. If the landlord does not correct the issue, such as unwilling to make a repair on the premises, the tenant may be able to “fix” the issue themselves and deduct from the rent or terminate the lease altogether. 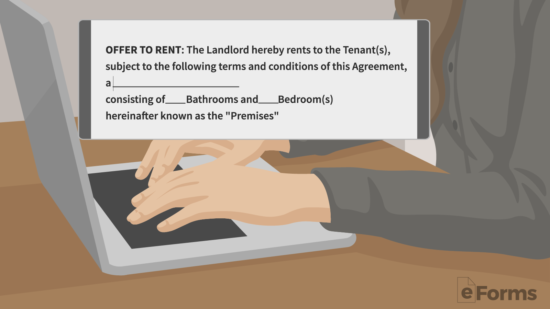 When writing a residential lease, it’s best to have the terms of the agreement fully negotiated between the landlord and tenant. After a verbal agreement has been established, the parties may pursue creating a written agreement by using a template that contains the language needed in accordance with the governing law of the State the property is located. Otherwise known as the “landlord” and “tenant”, decide who will be named in the lease. This is an important question that is asked to tenants that will be living together such as those in a romantic relationship. A general rule is if the rent can only be supported by both persons’ incomes, then it’s advised that both individuals are named as tenants. If there are children or anyone that won’t be listed as a tenant but living on the property, they will be named as ‘occupants’. As the tenant, he or she will want to know what is expressly included in the lease. If the property is a condominium, for example, the tenant should ensure that it’s included that he or she will have access to all facets of the property during the term. In addition, if the property includes parking or any other services that are available and accessible by the tenant, it should be included in the agreement. Before agreeing to a rent amount it’s a good idea to do a last check of the surrounding area to view the monthly amount being offered by other landlords. This can be done using RentoMeter which utilized third (3rd) party resources in order to inform a prospective tenant if they are paying too much by giving the median rent for a market area. It’s important to read what is included as part of the rent, such as utilities and services, as well as how the payment is to be made and which day of the month it’s due. Late Fees – If there are going to be any late fees it should be clearly established between the landlord and tenant. Most often there is either a fee for each day payment is late or for each occurrence. Some States have maximum limits so it’s best to perform a search of the laws where the property is located. Make sure that every appliance and piece of furniture that is mentioned in the lease exists on the property. If not, at the end of the agreement the landlord will be liable to claim whatever is mentioned in the lease as part of the property. 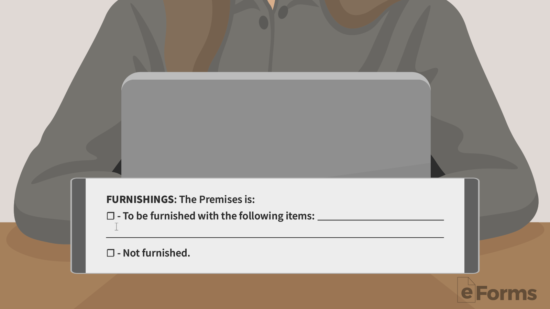 If a move-in checklist is being completed, this is not a huge issue, but the tenant should double-check to ensure that all is included as part of the lease. In most cases, a standard lease has a term of 12 months. Although, in some situations, such as if the tenant has employment restrictions or other matters, the agreement can be made for any fixed time-period. The tenant should enter the time-period that works best for their situation. Maximum Amounts ($) – Limits required by law for each State. 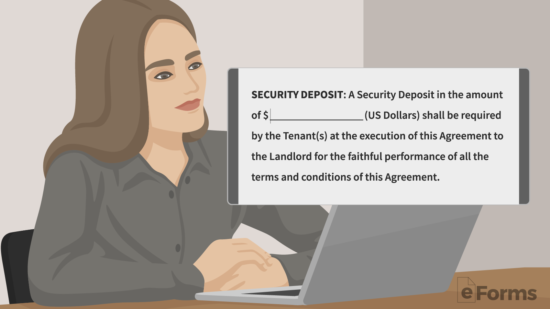 Returning the Security Deposit – The landlord will be obligated to return the security deposit to the tenant within the State required time-period. If the landlord and tenant decide to allow for the termination of the agreement it can either be done with or without a fee by either party. If a fee is required, it’s commonly equal to one (1) month’s rent and gives the other party thirty (30) days’ notice. This section can be entirely negotiated between the landlord and the tenant. There are no State laws or requirements that restrict this section. If there is a smoking policy, it must be mentioned in the agreement. 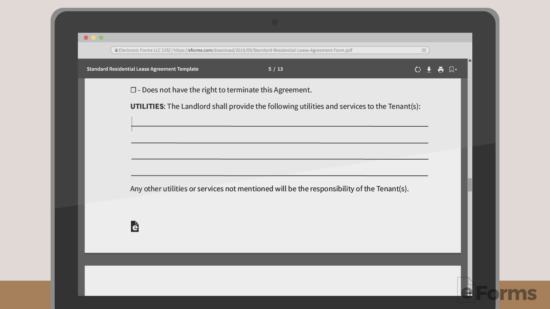 By default, if it’s not stated that the act is prohibited, the tenant may have rights to smoke. In California for example, it’s required that every lease mention what the policy is on the premises. While technically considered an occupant, pets are not a landlord’s best friend. Even if they are allowed on the property, the landlord should state exactly which types are allowed so that an “organic” tenant doesn’t have farm animals on the premises. Furthermore, it’s recommended that the landlord place a maximum weight the animal may be for liability (dangerous dogs tend to be larger) and damage to the premises. In most States, a landlord is allowed to charge an additional pet fee or deposit that is separate from the security deposit. 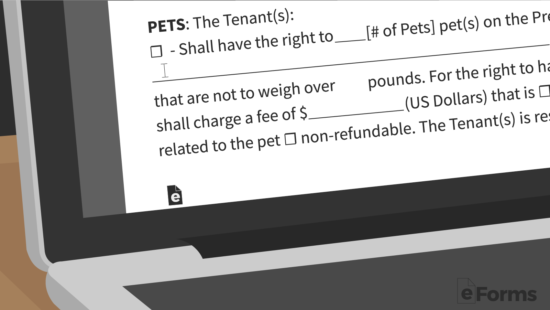 A landlord may use the Pet Lease Addendum to set rules for animals on their property. Perhaps the most important disclosure is to identify to a new tenant the existence of lead-based paint on the premises. Under federal law (42 U.S. Code § 4852d), if the structure on the property was built prior to 1978, the landlord will be required to issue the disclosure to the tenant. The disclosure casts a warning to the tenant that if they should see any chipping, deteriorating, or cracking paint on the premises to contact the landlord and authorities immediately.